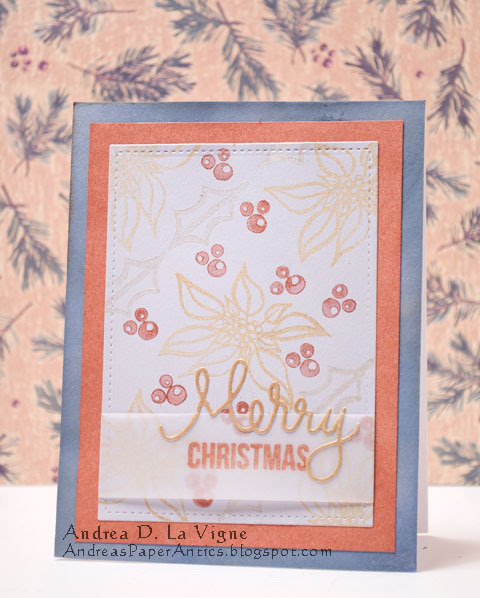 Kathy Racoosin had a lesson on Day 3 of Online Card Classes' "Holiday Style" titled "Elegant Mixed Metals." I created this card, inspired by hers. I die cut a piece of pale grey cardstock with one of Lawn Fawn's "Large Stitched Rectangle" dies. To create my patterned background, I stamped it with the poinsettia & holly leaf from "Mistletoe & Holly" from Essentials by Ellen, and one of the stamps from WPlus9's "Spring Blooms" set (berries). I used Tsukineko Brilliance Galaxy Gold for the poinsettia blooms, Platinum Planet for the leaves, and Cosmic Copper for the berries. Then I set that aside to dry. For the greeting portion, I die cut the "merry" from Simon Says Stamp's "Merry Christmas" die from white cardstock, and coated it with Galaxy Gold ink. I also cut a piece of vellum, and stamped the "Christmas" from the "Christmas" mini set, also by Simon Says Stamp, in Cosmic Copper. I wrapped the vellum strip around my die cut panel, and adhered the flaps of that on the back of the panel. When the ink on my "Merry" die cut had dried, I glued that down with Ranger Multi Medium Matte. I cut another piece of white cardstock (1/2" larger in both directions than my main panel), and inked around the sides with Cosmic Copper. When that dried, I adhered my die cut panel to that. I inked yet another piece of white cardstock with Hickory Smoke & Shaded Lilac--blending the colors together to create a warm grey--to create my outermost mat. When that had dried, I adhered my matted panel to that. Finally, I mounted my card front to a white A2 card base.